David "The Admiral" Robinson- In a league that has, at least to some degree, embraced the Thug Life, David Robinson was one of the good guys. A legitimate role model for children, Robinson graduated from Navy in 1987, thus his nickname. A genuine big man at 7'1", that was very comfortable and adept at playing with his back to the basket, as he was facing it, this gentle giant lived an exemplary life on and off the court. A 14-year league veteran who spent his entire career with the San Antonio Spurs, Robinson posted a double-double career average with 21.1 PPG and 10.6 RPG. A 10 time All-Star with 2 Championships ('99 and '03) Robinson was also ROY in 1990 and league MVP in 1995. Most notably he is the only player in NBA history to win the Rebounding, Blocked Shots, and Scoring Titles and Rookie of the Year, Defensive Player of the Year and MVP. Unfortunately (or fortunately depending on the way you look at it) his sole rookie card is readily available coming from the massively over-produced 1989 Hoops series. Raw copies can be found for less than a dollar on eBay often with no bidding. Even high grade examples and signed copies rarely command more than $20. You can see for yourself. 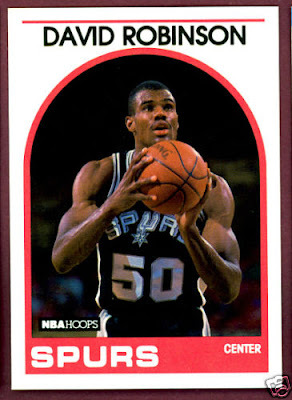 Congratulations to David Robinson, a class act all the way.